You know we’re on the home stretch when we’re working on documentation! I thought I’d give you a sneak peak of just one section of the Players notes so you know what we’re doing. Everything shown here is work in progress and all may change from what you eventually get in your hands. 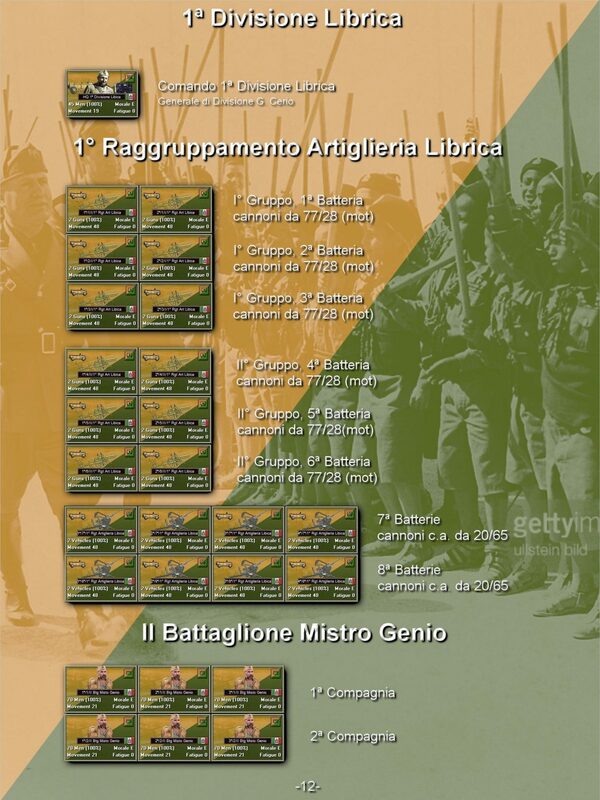 This section shown (order of battle) is for the Italians. 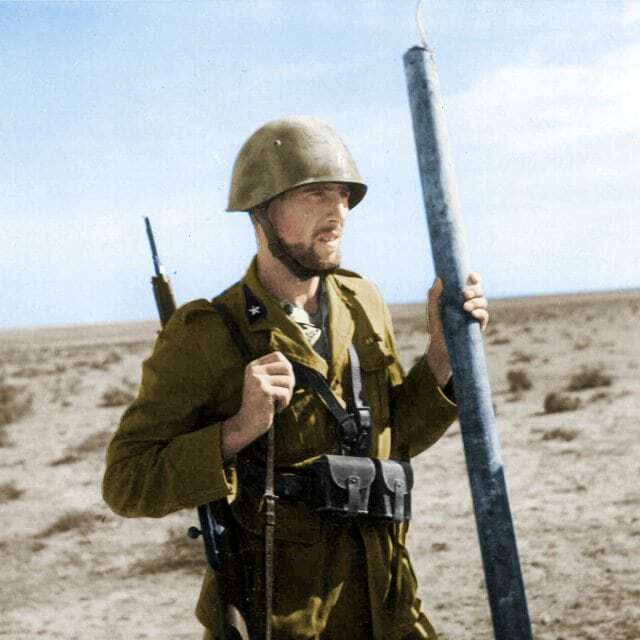 We already have the order of battle notes written up for the British, Commonwealth forces (Indian, New Zealander, Australian & South African), other Allies (Greek, Polish, Czech and French) and work is about to commence on the Germans. There will also be designer notes, scenario descriptions and other pertinent information included. The player notes in Normandy were 193(!!) pages long. I don’t expect North Africa to be that big, but we will only know when it is all pulled together. WOA!!! 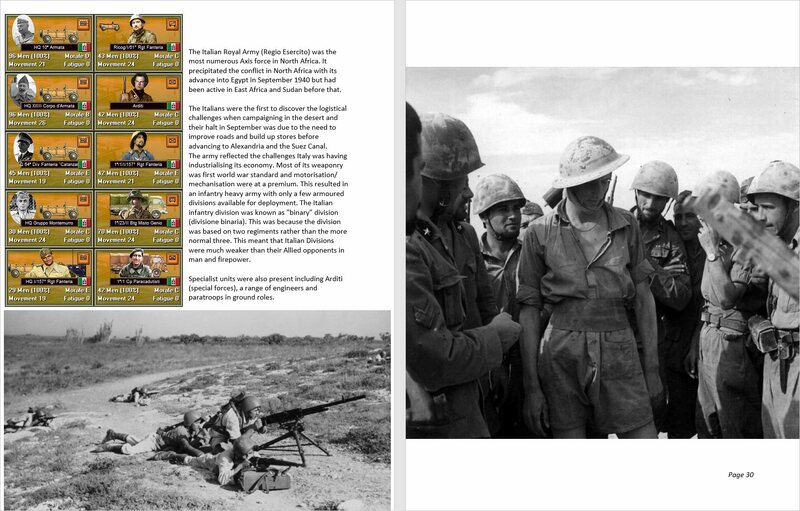 thanks a lot for the info, good start showing the italian notes, i think is the best nation to start showing what game can offer, in the end they are the forgiven army in north Africa even sometimes you see more info about a minor nation that send a few divisions or only 1 than italians that were the core of axis forces. 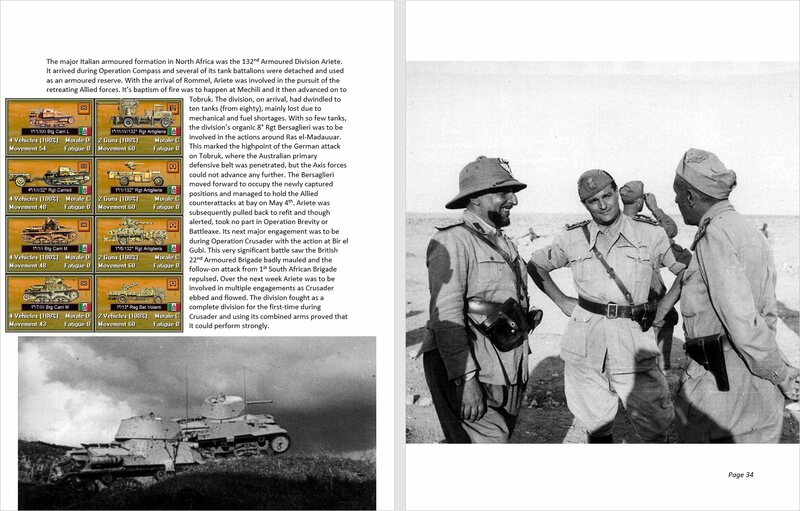 Nice first OOB panel showing libian division, is one of the most exotic units you can find in WWII even when in quality maybe was in the bottom. PD: i like a lot the vehicles portraits, looks we are going to have a lot of portees hehehe. Looking forward very much to the final product. I look forward greatly to this title as I am really enjoying the Normandy Panzer Battles title. 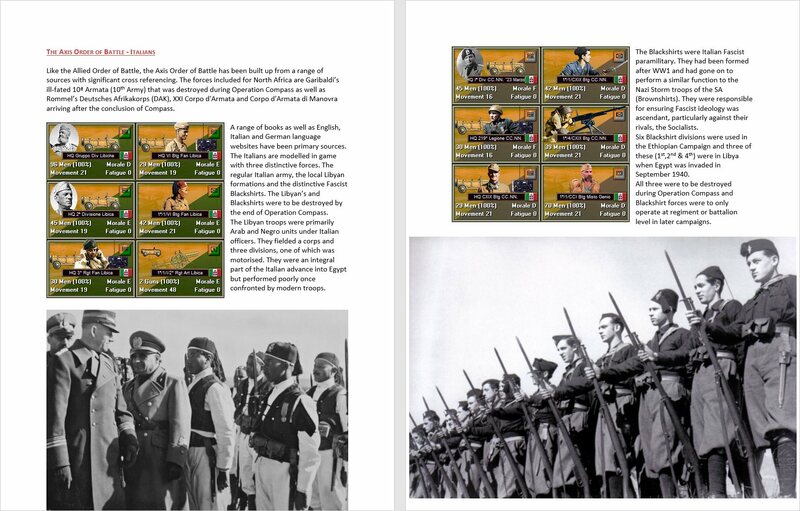 A North Africa installment really opens up a lot of amazing possibilities with the PzB engine. 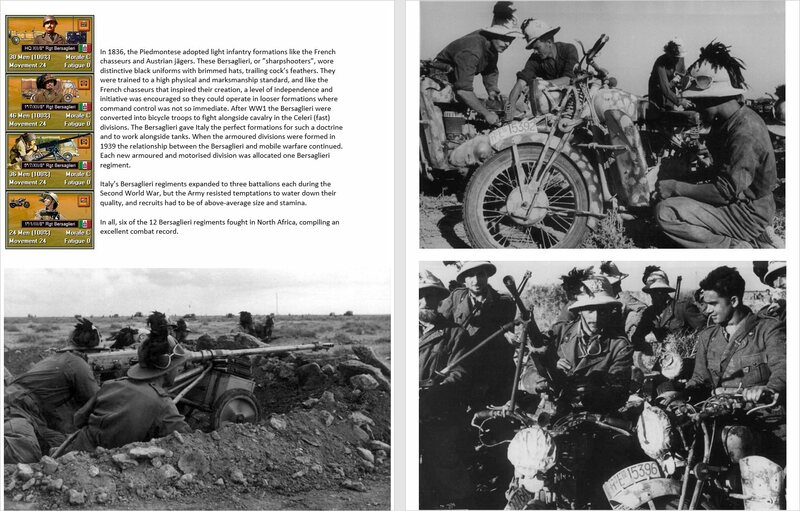 Fascinating here to see how the Italian troops are treated, especially their leaders. Very interesting. Everything looks great. I love the complete combined arms game play of the PzB series. Cant wait to get to mess around with everything within the Italian’s OOB. Did you guys know your site has been hacked? Google seems to thing so. Google is marking websites that use http vs https as unsafe. We’re in the process of changing all our URLs and legacy links to https, but as you can imagine it’s not a small task. Use of http is fine as long as you don’t do monetary transactions (which we don’t), but we are trying to update and stop worrying our clientele. Thank you for your incredible job!!! Thanks Stefano. Yes we have been made aware of the errors (over on our Facebook page). We are correcting them and will attempt to double check it all before release. The crazy thing is that they are all correct in the order of battle, but were incorrectly transcribed onto the sheet.